A logic game than enables the player to assume the role of the constructor of ski lifts, ski jumps and bridges. The developers from Huge Calf created a series of usually pretty but hard tasks. Carried Away is a logic game created for PC. In some ways it resembles Poly Bridge. The title was developed in the small company Huge Calf Studios founded in 2016. It is the debut of the young and ambitious group. In the game the player assumes the role of a designer and constructor of a ski lift. As in real life, we must face various problems – from unfavorable terrain to a limited budget. Despite that, the player must be up to the task as the safety of people depends on the constructions. While playing Carried Away for PC, the player is thrown from one task to another. The game starts on a small map filled with hills, holes, trees etc. The player is tasked with constructing a ski lift that transports tourists to the very top. In order to achieve the goal, they use various fragile pieces that are combined into a single line. 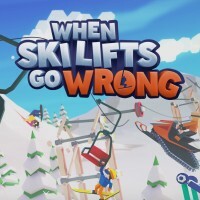 While creating the lifts, the player must keep in mind various things, like the trees – a skier mustn’t fall into a tree while riding up. In addition to that, the constructions can collapse under the weight of the people. Player must also consider the angle of inclination of the hills. The ski lifts are not everything – the player must also construct ski jumps and ramps for the skiers. The editor implemented in the game enables the user to easily connect various parts. The game encourages the player to experiment and create constructions that are more advanced and cheaper. Carried Away for PC features a campaign mode with various tasks. If the player completes it and wants more, there is a level editor available as well. There the user can determine the topography and scenery. Created maps can be shared with other people and the player can download the works of other players.